Interested in an affordable, yet sporty crossover? Look no further than Honda’s HR-V. This subcompact vehicle, seating up to 5, is turning heads and earning praise. Styled like a coupe, its exterior design has an air of excitement about it. Note the sleek curves and the desirable hatchback. It’s not only visually appealing, the HR-V boasts the amazing Magic Seats. You can easily configure the rear seats three different ways to maximize cargo capacity up to 58.8 cubic feet. Go ahead, we dare you to see how much gear you can fit in the HR-V! 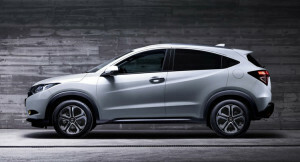 Honda offers the HR-V in three trims, the LX, EX and EL-L Navi. Standard are such features as the rearview camera and Magic Seats, or upgrade to the EX-L Navi for perks like navigation, leather seats and roof rails. Choose between automatic transmission with a fuel economy of 28 mpg city and 35 mpg highway or manual with 25 mpg city and 34 mpg highway. The HR-V has a 1.8 liter, 4-cylinder engine and is available in either front-wheel drive or all-wheel drive. Take a test drive and feel the Honda difference. It’s comes as no surprise that the #HondaHR-V is a winning formula. Why mess with perfection? To prove this point, there aren’t any noteworthy changes to the 2017 model from its 2016 predecessor. You may want to consider the 2016 HR-V and make it even more affordable! Check out our Honda events for end-of-year clearance sales on our website at http://www.formulahonda.com. If you’re looking for friendly Honda dealers in Toronto, stop by Formula Honda today for a full selection of all the best that Honda has to offer.